"Ocean Fortress" Desalination Plants can supply small to large quantities of the low cost fresh water without harming the environment and when powered by low cost renewable energy, like a MEC "Super Watt Wave Catcher Barge," an "Ocean Fortress" Desalination Plant can supply the lowest cost desalinated water in the world. Flat sided hulls have the lowest fabrication costs. Today very wide flat sided hulls can be fabricated with an optional retractable counterweight. 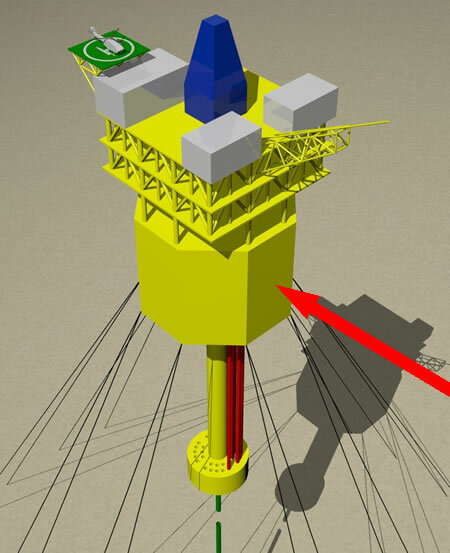 Heavy Lift Vessels (HLVs) can transport the Ocean Fortress to site for offloading with the counterweight retracted. After vessel offloading, the counterweight is flooded and locked off at its final installed position. The counterweights minimize hull size and costs and maximize vessel stability. Optionally, solid ballasted can be added to the counterweight. 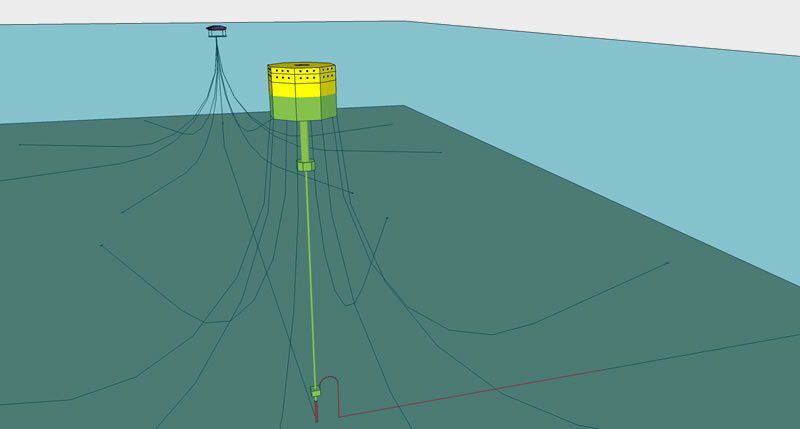 Requires only a conventional offshore spread mooring system. Does not require expensive multi-product swivels or an expensive turret mooring. More information about the "Ocean Fortress©" Desalination Plants and additional graphics are available by clicking on the attached presentation. Additional fabrication and installation sequence information is available by clicking on the Ocean Fortress© Brochure. Additional information can be obtained by emailing dgehring@marineenergycorp.com. Lower cost "Ocean Fortress©" Desalination Plant fabrication, transportation and installation methods are being developed all the time as well as lower cost forms of renewable energy like MEC's "Super Watt Wave Catcher Barges." All of these MEC developments provide a bright hope for huge new quantities of low cost desalinated water and low cost electric power. "Ocean Fortress" Desalination Plants take water from the ocean, filter it, remove its salt content, treat it and export it. The resulting high salt content water is harmlessly discharged back into the ocean causing no harm to the environment or coastal estuaries. 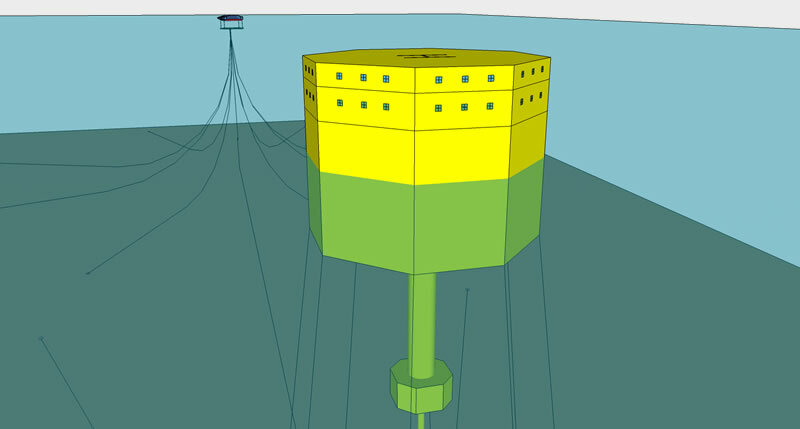 If the "Ocean Fortress" Desalination Plants are powered by low cost renewable energy, like that supplied by MEC's "Super Watt Wave Catcher Barges," the desalinated water will be produced with hydrocarbon emissions into the air resulting in the lowest cost desalinated water in the world produced without environmental pollution of any sort. Export power cables can either be draped from the "Super Watt Wave Catcher Barge" to the "Ocean Fortress" Desalination Plant or laid on the seabed. A power cable to shore can supply excess electric power to the onshore communities, and the cable will allow onshore community power to be supplied to the "Ocean Fortress" Desalination Plant in the rare times of low wave energy. Ocean Fortress© Desalination Plants can optionally store millions of gallons of desalinated water onboard for subsequent vessel transport to their end users. Onboard water storage will eliminate pipeline CAPEX costs, but will also increase the vessel CAPEX cost and its water transport OPEX costs. Vessel transport delays due to weather conditions or vessel problems may be expected to reduce the reliability of water delivery. Onboard water storage will increase vessel CAPEX costs by requiring the vessel hulls to be bigger but also by requiring the vessel's topsides to be bigger to house the equipment that can no longer be placed in the vessel hull. 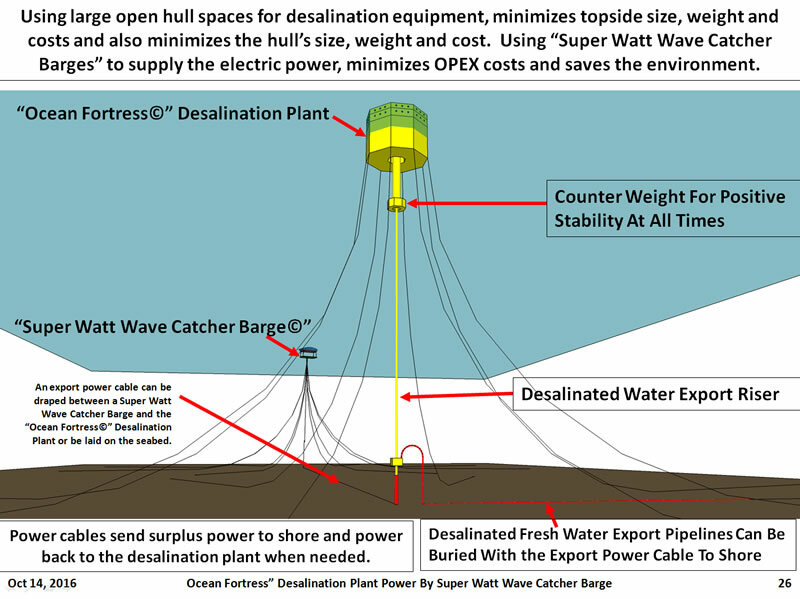 "Ocean Fortress©" Desalination Plants, when powered by a "Super Watt Wave Catcher Barge,“ like the one above, can supply large quantities of very low cost fresh water if located in shallow water or ultra deep water. "Super Watt Wave Catcher Barge" shown above uses a turret mooring that allows the barge to weathervane into the strongest waves at all times for maximum power output even in ultra deep water. "Super Watt Wave Catcher Barges" can also supply surplus power to the onshore grid maximizing the economics of the "Super Watt Wave Catcher Barges." Power cables to shore can be laid at the same time as the export fresh water pipeline and buried at the same time, saving significant installation costs. Power sent onshore can be used to power the local communities, remote communities and to power booster pumps to deliver fresh water over long distances to remote communities. 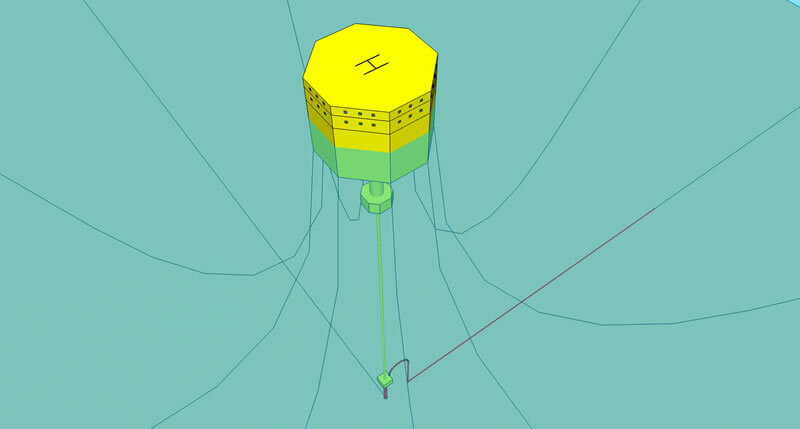 "Ocean Fortress" Desalination Plants without fresh water hull storage can locate desalination equipment in their hull, reducing their topside's size, weight and cost as illustrated by the catenary moored "Ocean Fortress" Desalination Plant shown below without an elevated topside. 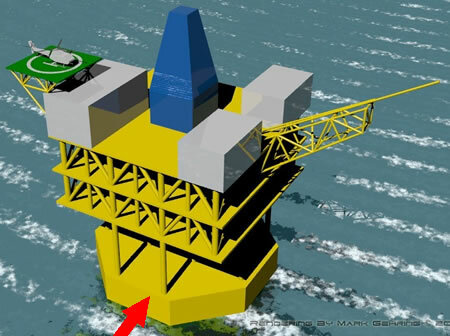 The "Ocean Fortress" Desalination Plants, as illustrated below, can have both helipads and boat landings for quick and safe crew access, allowing the plant to be well maintained and to be running 99% of the time or higher. Note the hard pipe riser with its own bottom counterweight in both the upper and lower illustrations. 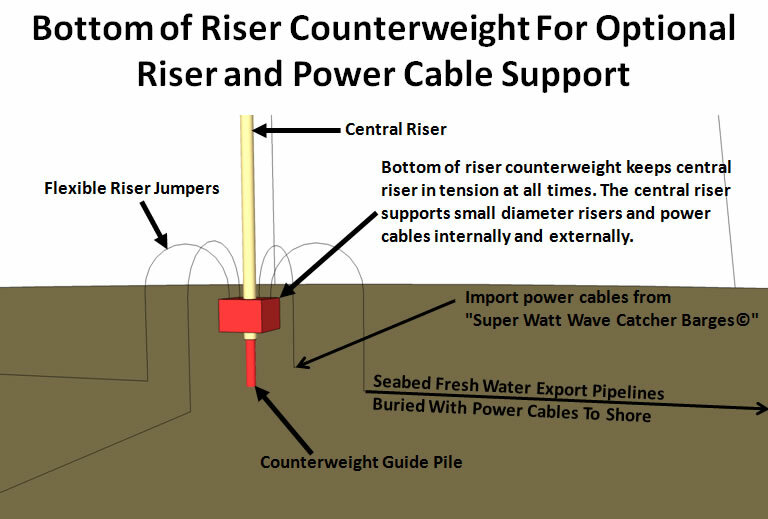 The hard pipe riser provides a low cost way to pipe the fresh water to the seabed pipeline and a low cost way to support and protect import and export power cables to and from the seabed. The illustration below shows how the hard piped central riser is maintained in tension by its lower counterweight. The Central Riser can house, protect and support small diameter export water risers, power and control cables, etc.